Wheel Music is another music visualization, using similar techniques to those I used in my Whitney Music Box. 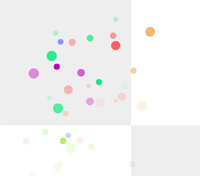 Each dot in the animation represents an individual note you are hearing. The notes are slowly traveling around in a circle. Each square represents a different tone cluster, or chord. Colors represent note values, and the radius of the circles is loudness. The “Wheel” in Wheel Music is a recurring theme in a lot of my pieces, which often involve circles, oscillation, and radial symmetry. The cylindrical pattern that the notes form is reminiscent of a barrel organ, one of a handful of automatic instruments which this piece is intended to evoke, others being player pianos and wind chimes. I made Wheel Music using various technologies, including Python, Syd, and Flash. The score was generated using a Python script which generates note values and outputs to them to a text file in the SKINI format (similar to MIDI but more flexible). My software synthesis program, Syd, was used to render the audio score as a WAV file. I wrote another script which converted the SKINI score into an actionscript array, which I used to render the animation in real time in Flash, the animation is a literal rendition of what is going on in the score. This entry was posted on Wednesday, June 21st, 2006 at 1:25 pm	and is filed under Jim's Projects, Linkydinks. You can follow any responses to this entry through the RSS 2.0 feed. Both comments and pings are currently closed. Exceptional concept! A CAT scan slice of a universal truth. I have never seen such fantastic translations of incredible vision into succinct beauty. Can we use these flash files with credit?? ?